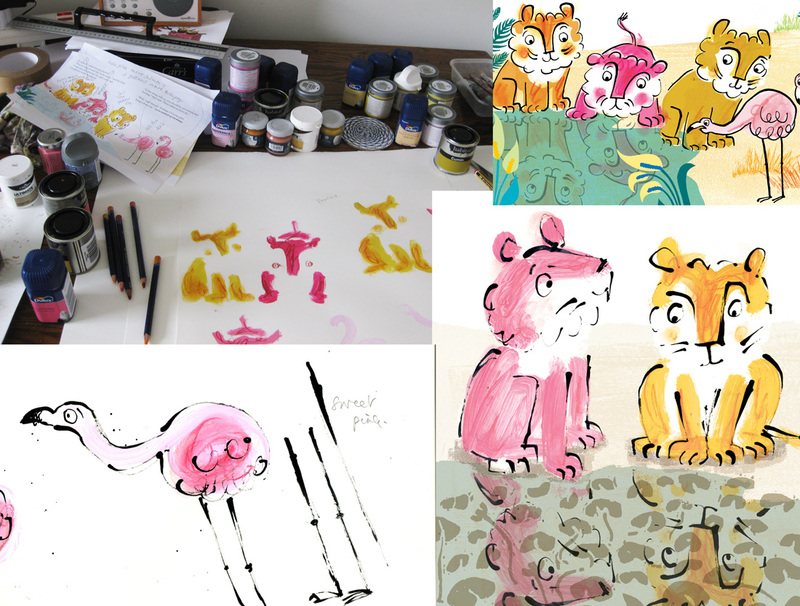 I’m busy in the studio experimenting with different media for my new book, Pink Lion – to be published by Walker some time next year. Because of the story, the predominant colours are yellow and pink – sadly not complementary colours, so I have become very fussy about exact shades of mustard, coral, bubblegum etc. in my attempt to find the right ones. Browsing through a book of Picasso’s drawings and paintings, I saw that he often used household paint. So I nipped down to Homebase and came back with a bag of tester pots with delicious names like Cumin and Hibiscus, and have been having fun experimenting with some very rudimentary old school brushes, scribbly pencil and line applied in Indian ink with a chopstick. I’ve also been trying out a more digital approach. This entry was posted in animals, Illustration on June 17, 2015 by Jane Porter.